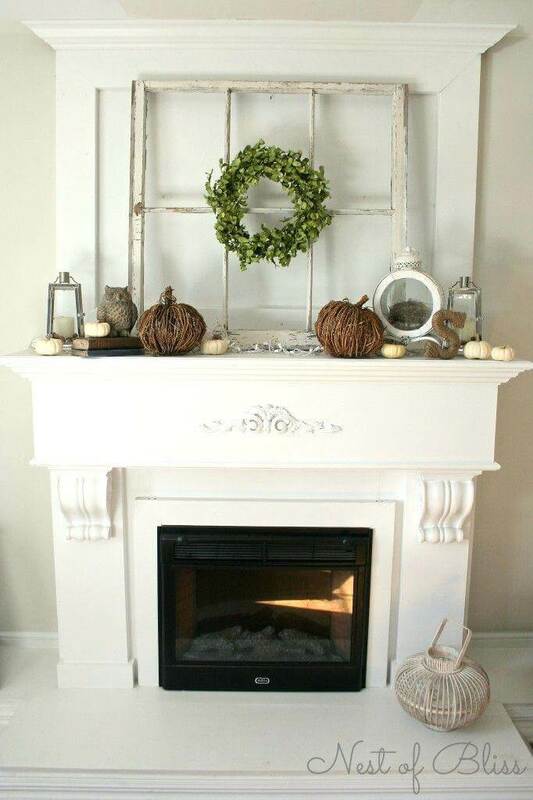 If you’re lucky enough to have a fireplace, then you’re practically obligated to decorate the mantel. If the old-fashioned mantel clock and urns combination doesn’t work with your home, then you’re not alone. Maybe you’re tired of the same old family photo montage. Or maybe you just want something special for the holidays. 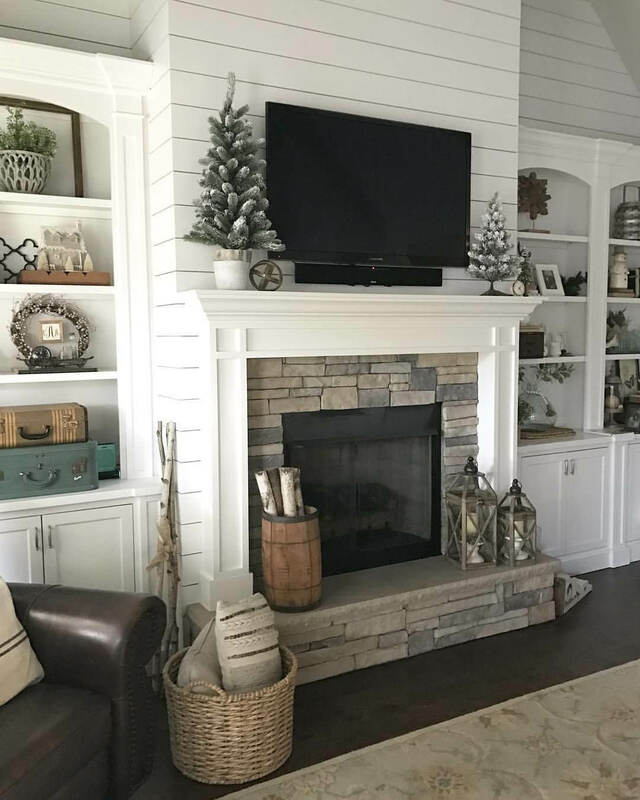 Regardless of why you’re looking to make a mantel change, our gallery of 28 farmhouse mantel decor ideas makes pulling off a designer mantel makeover easy. The farmhouse style is all the rage right now, and with good reason. Who doesn’t love the warm patina of old hardwoods or the lived-in look of whitewashed accents? If you’re reading this, then obviously you love them. Wondering how you can work that aesthetic into the space over your fireplace? 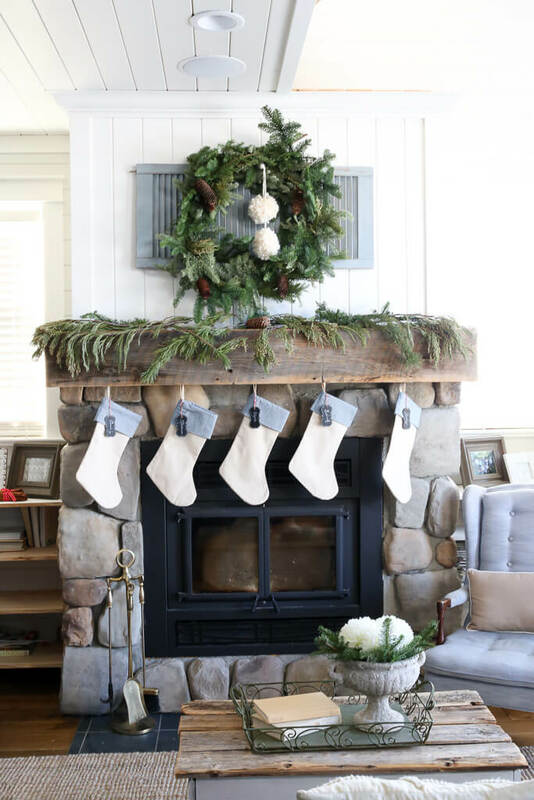 With our list of farmhouse mantel decor ideas, it’s surprisingly simple. Just scroll through, save, or share. We’ve got great ideas incorporating everything from French provincial iron accessories to a farm fresh found windmill. 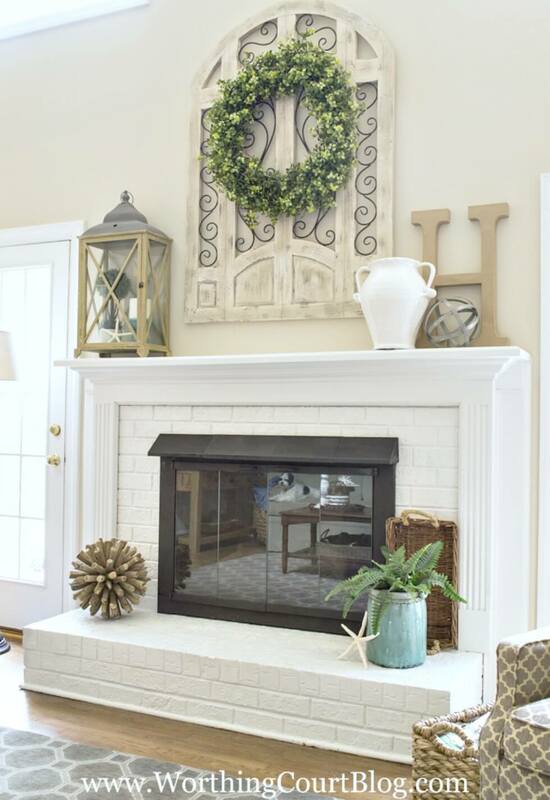 Keep reading to find an easy template on how to give your mantel a professional finish. We’ve got understated everyday looks to impress your guests all year-round, and we’ve also got you covered for the holidays. 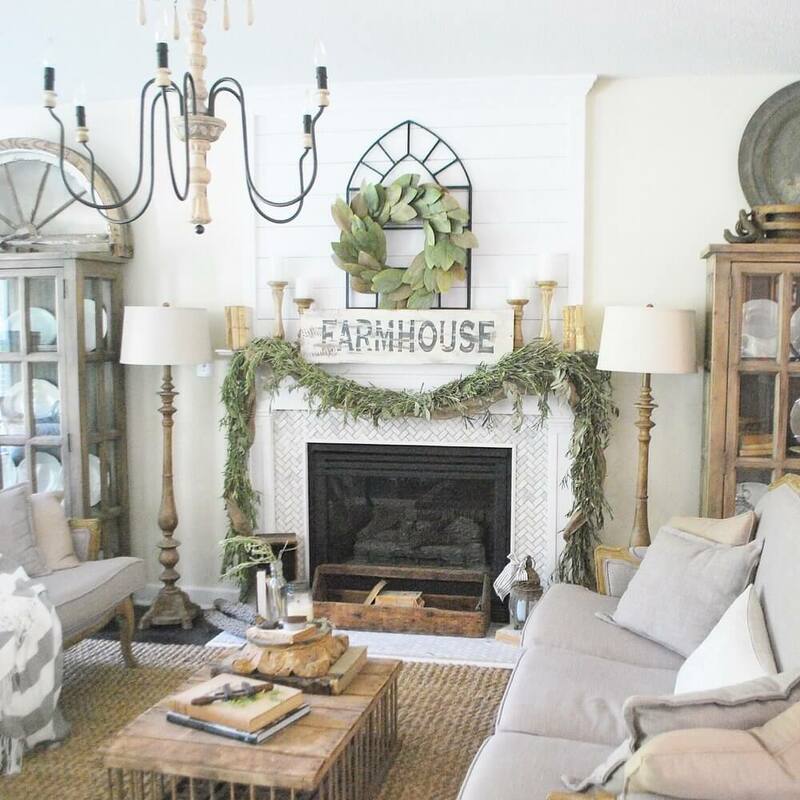 This mantel updates the farmhouse look with a salvaged wood and wire gate. The gate is whitewashed and hung on the wall with a pretty green wreath. On the mantel, a large lantern holds a topiary and beach themed decorations like a starfish. A tall urn and a metal openwork ball take up the other side, along with a large initial letter. 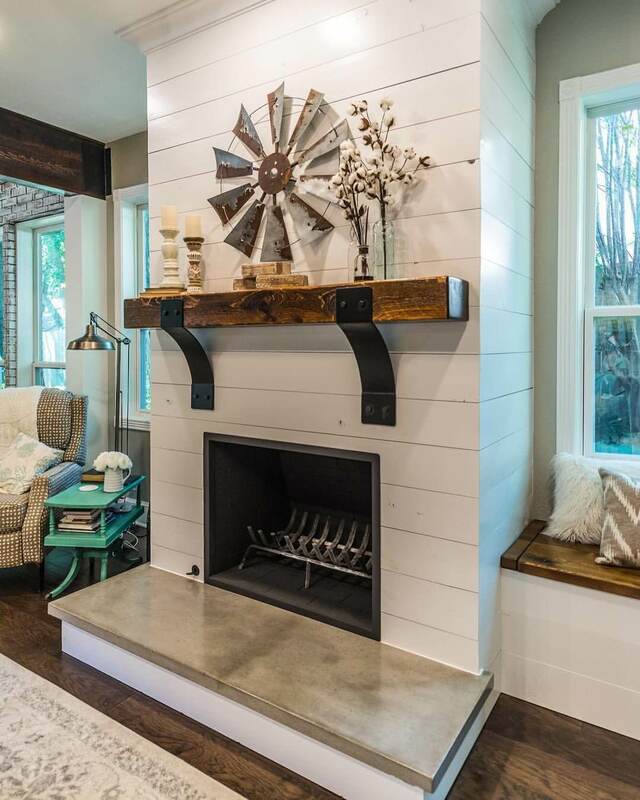 This understated and stylish mantel has an exposed beam mounted on the wall. On the beam are placed two tall pillar candles, a vintage-look windmill with rusted details, and vases with cotton blossoms. The simple brown, white, and metal color palette looks great with farmhouse style. 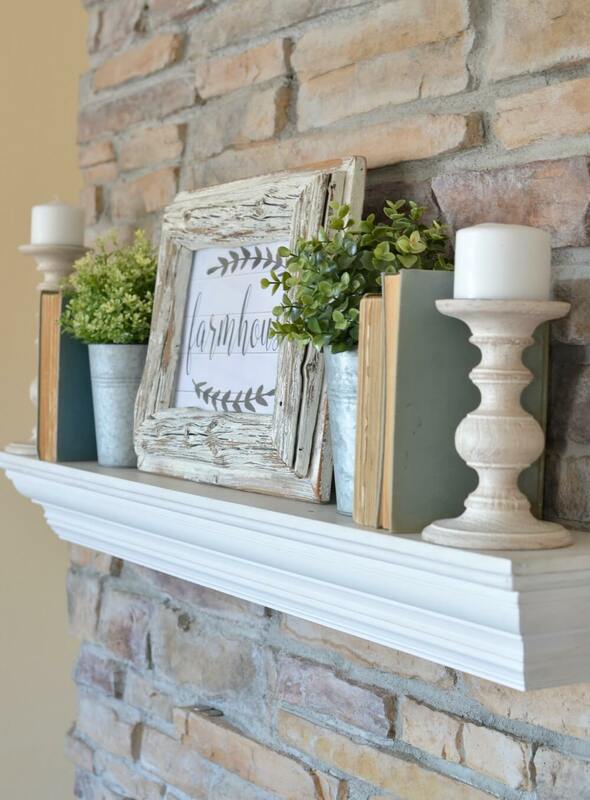 Found farm windows and a twine memory board highlight this mantel arrangement. The windows are laid in the middle, overlapping for an interesting texture. Books, glass vases, little topiaries, and white flowers fill out the rest of the arrangement. The items are arranged with different heights for more visual interest. For a stylish, neutral look for Thanksgiving, try this arrangement. A barn window with shutters takes up most of the mantel space. A softly textured cotton wreath hangs on the window. In front of the window, there are three cute mini pumpkins with stenciled lettering. 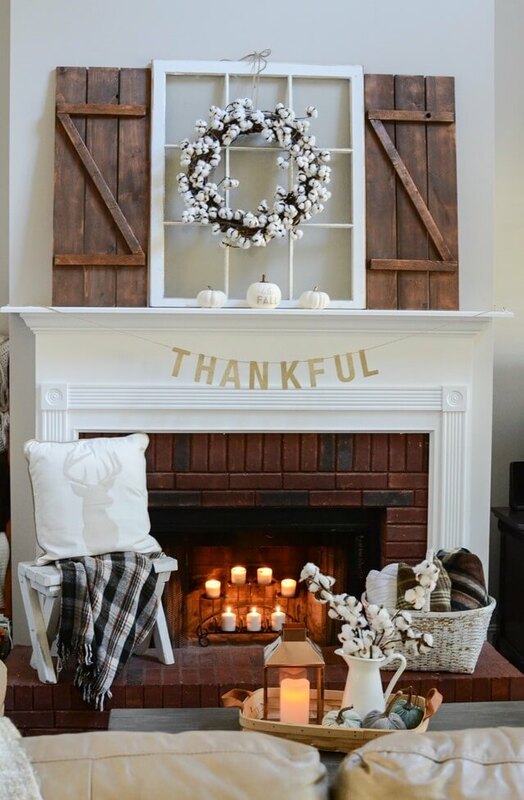 A “Thankful” banner hangs on the mantel. This arrangement celebrates the holiday in a refined style. 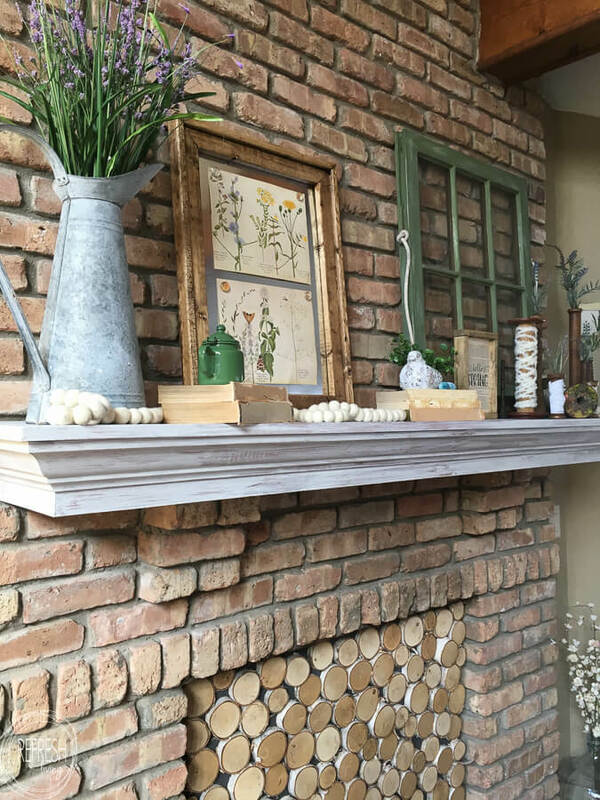 This farmhouse mantel combines a number of design elements into a pleasing arrangement that can be updated for each season. In the middle hangs a small glassless window with an embroidery hoop wreath. Small sized globes decorate one side of the mantel. A vintage milk box with a stenciled sign sits on the other side. The window theme is strong in this charming arrangement. The window provides architectural interest. A lettered sign hangs in the top of the window to draw the eye upward. 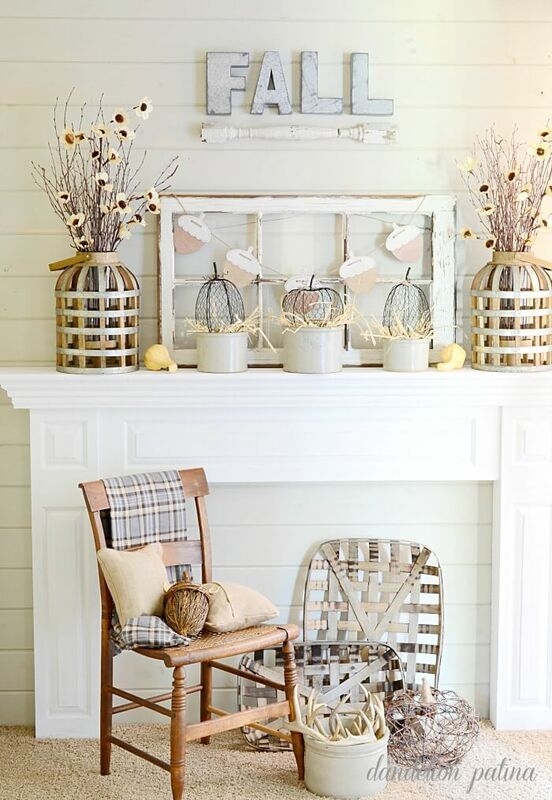 A cozy arrangement with many different elements fills the mantel shelf. Cotton blossoms in a tall, galvanized pail provide a soft texture. Gourds are wrapped in burlap for an extra rustic touch. 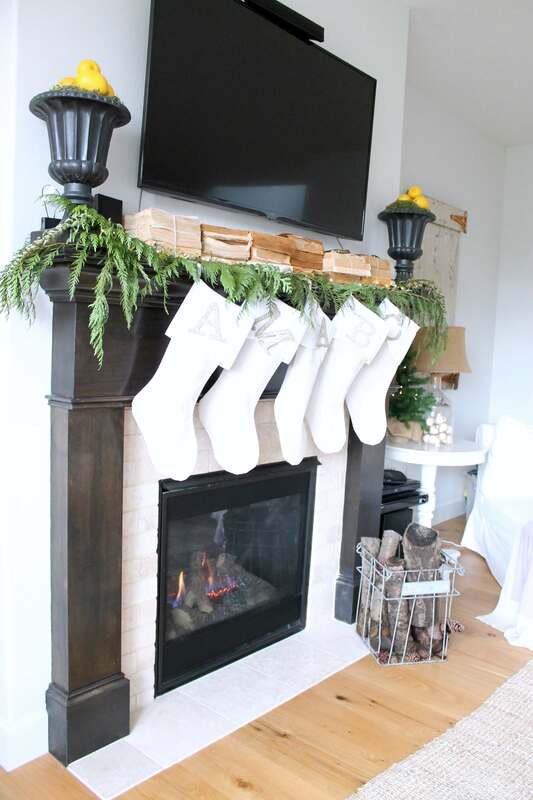 When decorating for Christmas, don’t stop at the fireplace. A farmhouse window with shutters hangs on the wall. A natural-looking pine wreath with a textured burlap bow decorates the window. Snowflakes are placed at different heights. Two cute trees flank the arrangement on each side. Pinecones fill out the mantel and evoke a Christmas forest. An inspiring sign is the focal point of this calming arrangement. By using neutral florals and greens, this arrangement is subtle without being boring. The combination of textures from the cotton, dried grass, and sage leaves brings a unified look. The cotton and sage branches stand in tall galvanized olive buckets. 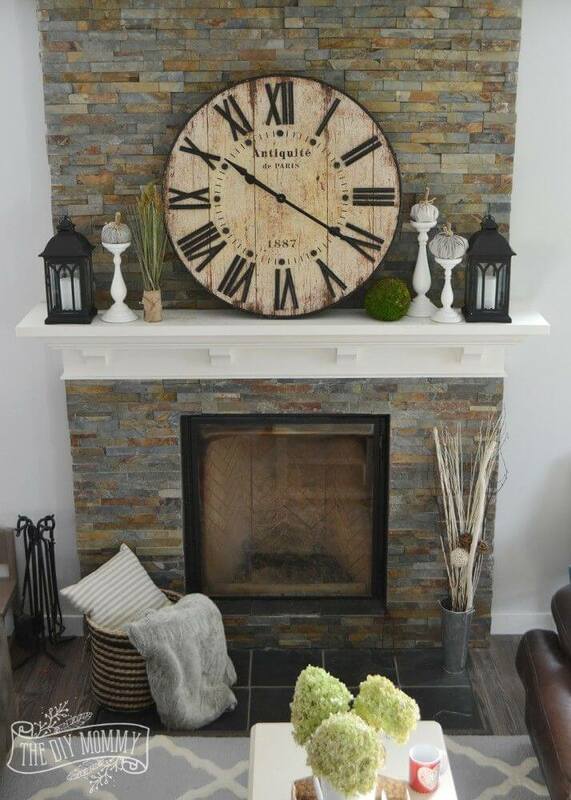 This arrangement is highlighted by an oversized weathered wood clock. On the mantel, there are two candle lanterns in black. Next, to the candle lanterns stand adorable little gourds at different heights. A dried grass arrangement provides height next to the clock. A moss topiary ball rounds out the mantel. 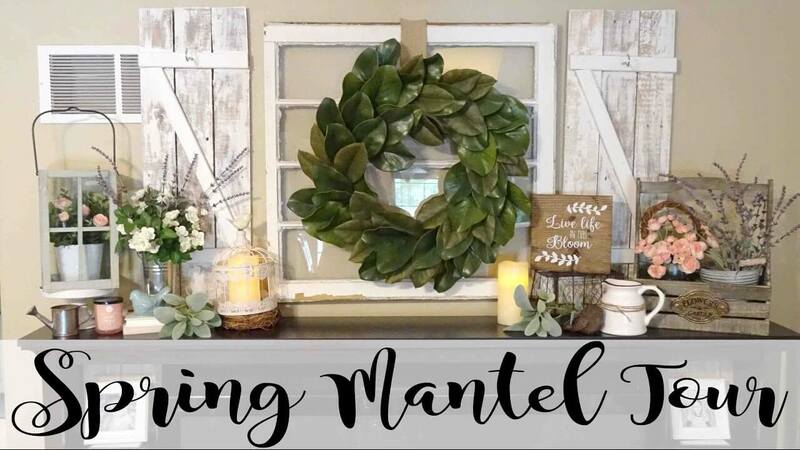 A fresh and sweet springtime mantel starts with a window and shutters. A wreath with thick, glossy leaves highlights the center of the arrangement. The mantel is decorated like an old-fashioned cottage garden, with different florals, succulents, and little accents like a watering can. A silk rose plant is tucked away in its own lantern. 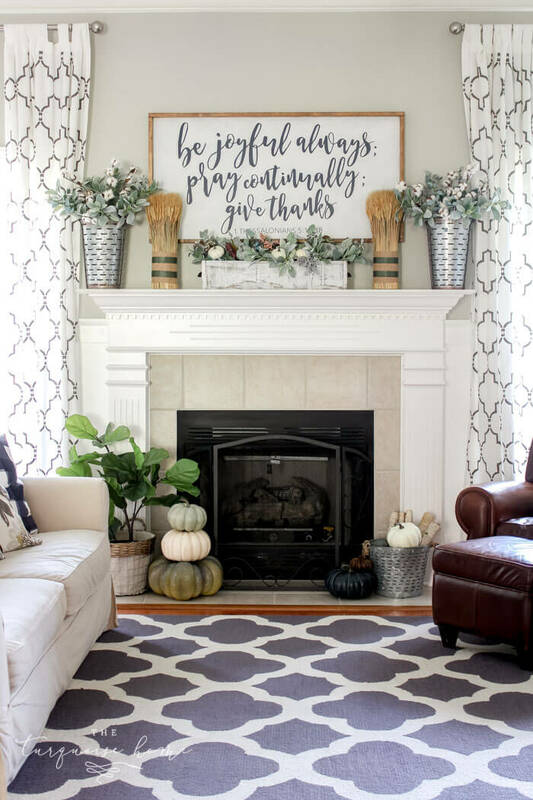 A light and subtle fall mantel combines salvaged and DIY touches with tall, chunky vases and adorable little chicken wire pumpkins. The galvanized letters on the wall are blocky and practical. A salvaged table leg hangs below the letters. The window leaning on the mantel is strung with a paper acorn garland for a cute touch. An inviting Christmas mantel brings forest style indoors. An asymmetrical, DIY-look wreath hangs in front of a gray shutter. The wreath is decorated with natural pine cones and fluffy pom-poms for texture. On the mantel, evergreen branches are draped for an old-fashioned look. The neutral stockings have hanging name tags. 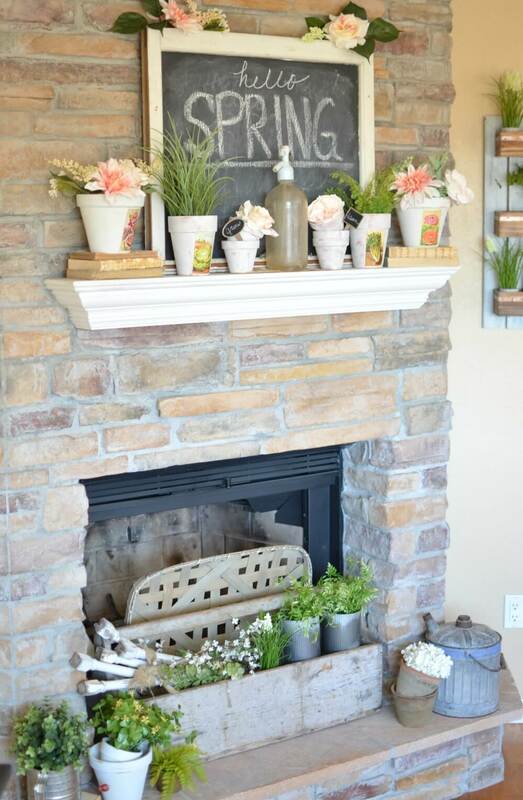 This bountiful spring mantel arrangement combines a cute chalkboard sign with abundant florals. The chalkboard sign is an excellent addition to any farmhouse kitchen or living room since it can be updated with practical information or with seasonal greetings. Peach and pink blooms are crowded onto the mantel, and a vintage glass bottle stands in the middle. This arrangement combines a mantel area with a TV area. Since the TV is there, the mantel arrangement can’t be overly complex. Books with their pages facing out are stacked in the center of the mantel. Cascading cedar covers the mantel itself. Pure white stockings with silver glitter initials hang in front. Two tall urns with lemons provide a pop of color. Flocked mini trees decorate this mantel. They are at different heights for visual interest. They are also tucked out of the way of the television. A small metal openwork globe sits on the mantel shelf. This arrangement is subtle and elegant, providing a nod to the festive season without being too fussy. 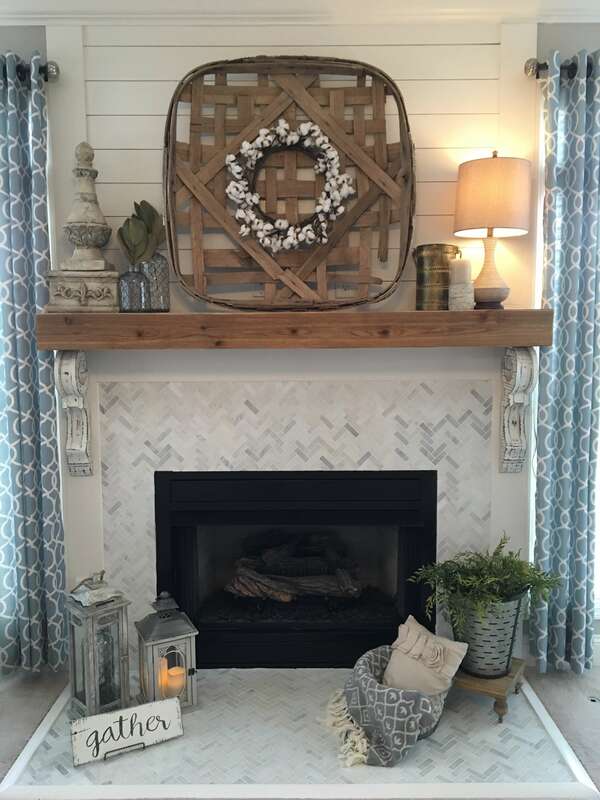 A large wooden gathering basket provides a backdrop for this mantel. A softly textured cotton wreath hangs in the center of the basket. On one side of the basket stands a vintage finial with period detail. Two small glass bottles clad in wire stand beside it. On the other side of the basket, a brass pail, a pillar candle, and a small lamp take their places. This bold mantel design is highlighted with a large metal windmill. 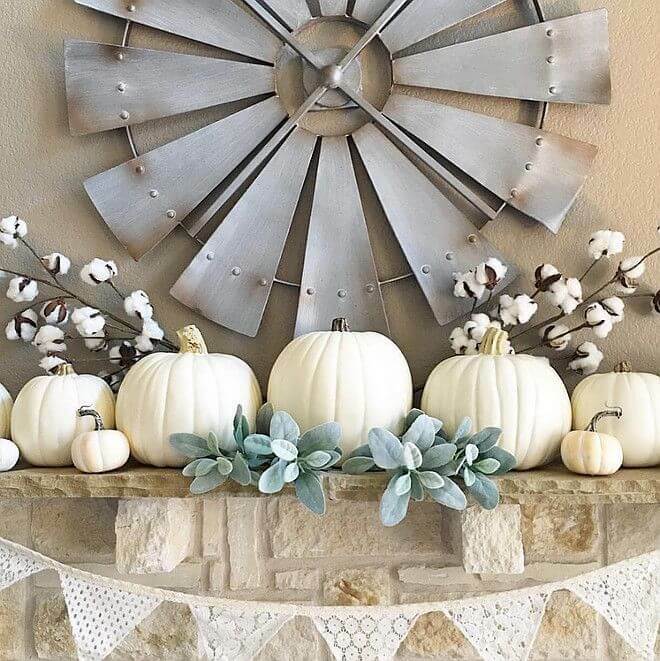 In contrast to the industrial quality of the windmill, the greens and pumpkins have soft colors and textures. White pumpkins of graduated sizes stand in the front, with lamb’s ear leaves tucked in between for color. Graceful white cotton blossom stems stand behind the pumpkins. This dramatic design is highlighted by an oversized “Farmhouse” sign. On the wall hangs a metal piece that brings a window to mind. A wreath with large green leaves decorates the window. On the mantel, there are gold pedestals of various heights with white pillar candles. A drooping garland of greens drapes over the mantel to complete the look. 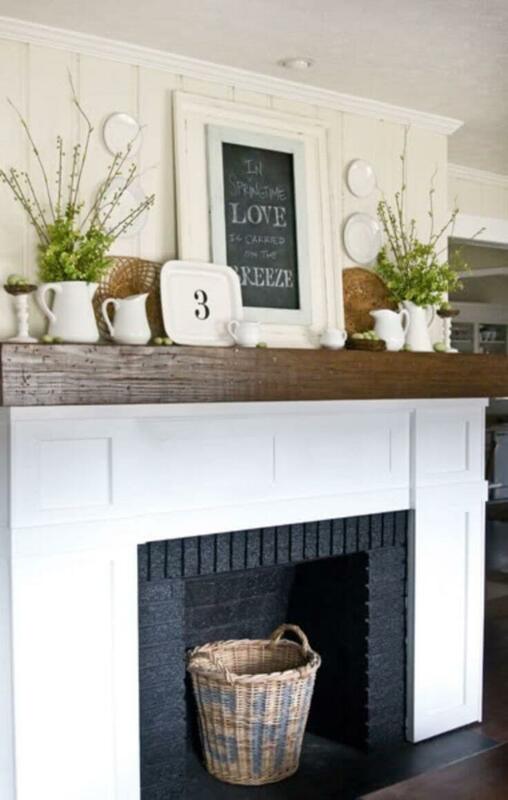 Combining a cute framed chalkboard sign with crockery of various shapes and sizes, this mantel has many white objects. The blackboard provides contrast, along with the oversized 3 on the plate. Baskets are tucked behind the dishes. Tall greens fill two of the pitchers, bringing height to the mantel. 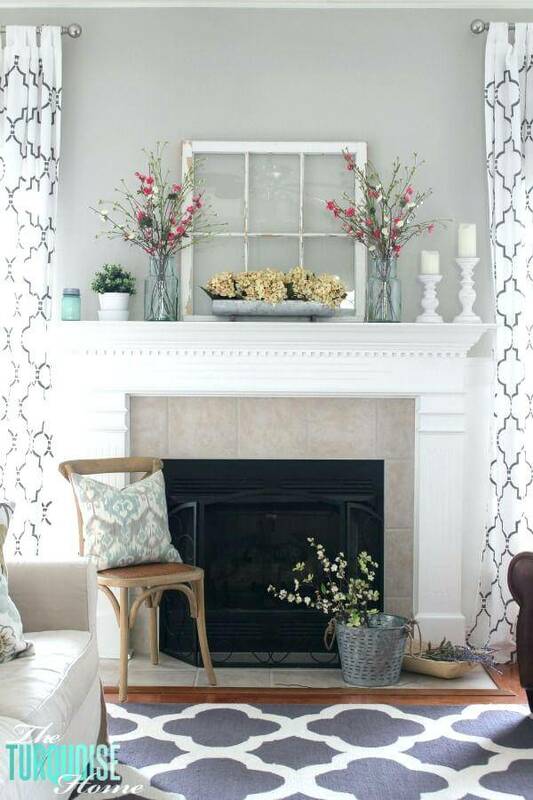 In neutral shades, this mantel is capped off by a vintage distressed window frame with the glass removed. An understated boxwood wreath sits in the center of the window. On the mantel, there are many autumn touches. Grapevine pumpkins give texture to the arrangement. Glassware and lanterns fill out the back of the arrangement, and tiny white pumpkins give a cute accent. 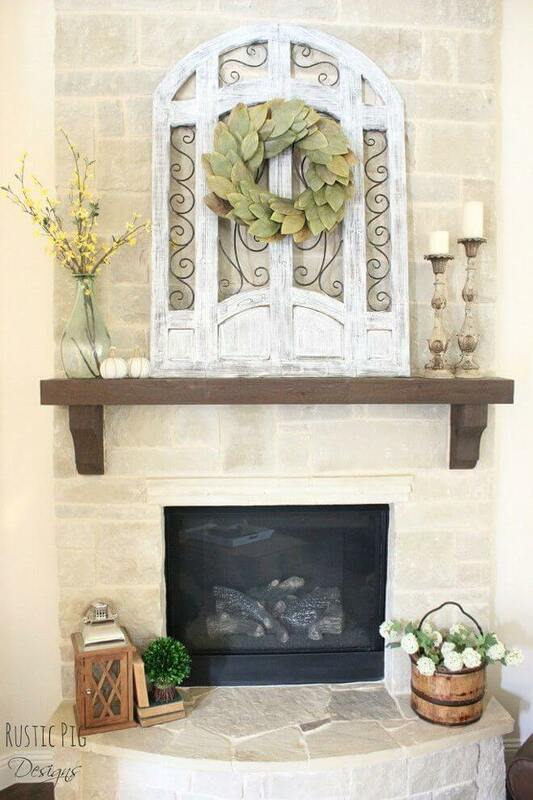 This mantel has an asymmetrical, jumbled look that is quite charming. It seems less like a planned arrangement and more like the items just ended up there. A green window frame and a framed botanical print stand at the back. A tall galvanized metal pitcher stands at one side with overflowing stems of lavender. A garland of pom-poms brings it all together. This is an understated arrangement for springtime. A garden gate with metal scrollwork occupies the center of the mantel. The gate is hung with a wreath with oversized leaves. The color of the leaves is soft for a subtle look. A tall glass vase with forsythia stands on one side, and two pedestals with pillar candles on the other. 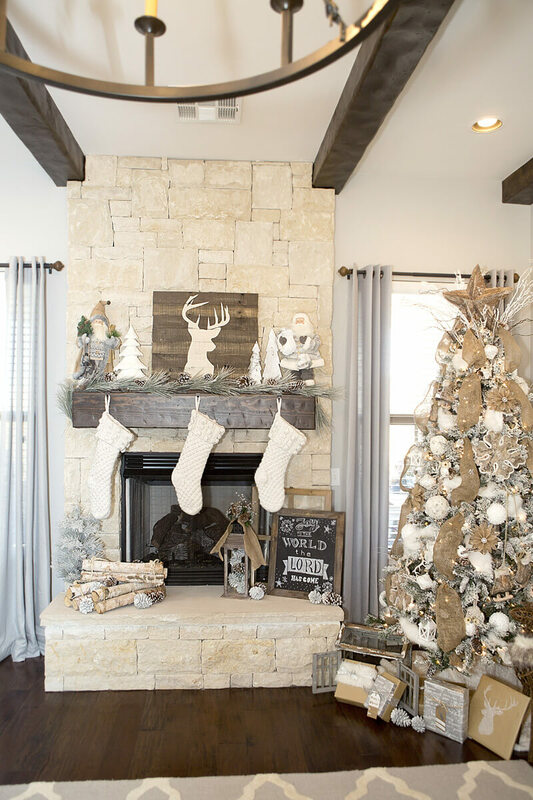 This stunning Christmas mantel combines rustic touches with modern elegance. Standing at the back of the mantel is a silhouette of a deer. White trees and Santas fill out the mantel, along with a generous pine garland with cones attached. The stockings are knit of a soft white yarn with pom-poms for texture. 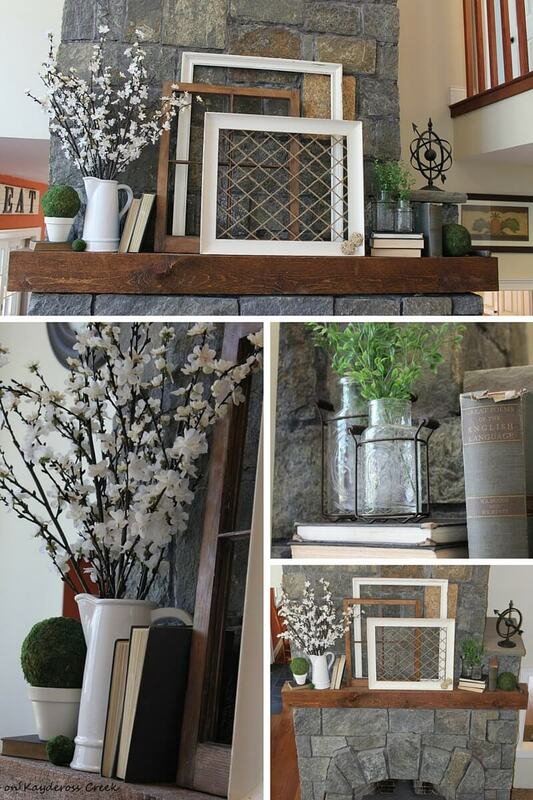 This simple springtime arrangement starts with a vintage window, this time with the glass left in to reflect light. Tall glass vases stand on either side of the window, holding a mix of pink and white silk blossoms. In front of the mirror, there is a trough with off-white flowers. The arrangement is completed with candles and a small green plant. 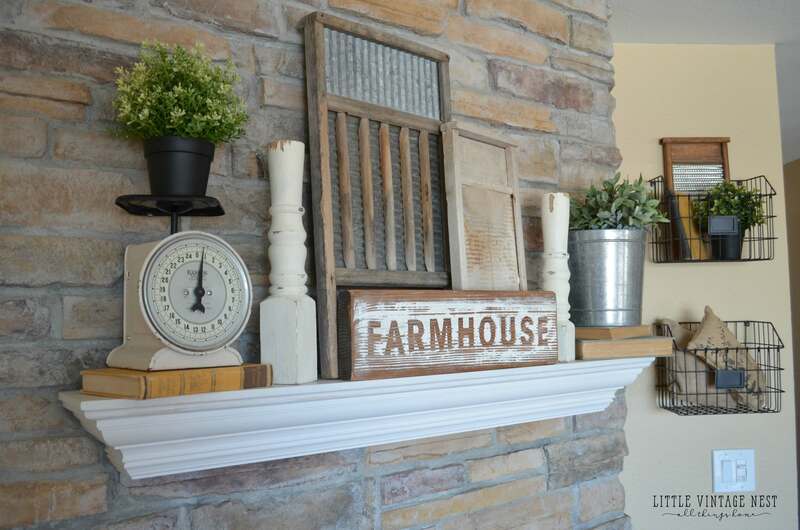 This subtle mantel relies on a “farmhouse” lettered sign as its focal point. Greens in galvanized pails flank the sign on either side. Books with their spines turned inward for a more unified look come next, and then two pedestals with pillar candles. The pedestals are at different heights to bring the arrangement more visual interest. This eye-catching arrangement fills a mantel with black and white accents. A huge clock with vintage numerals hangs in the center. 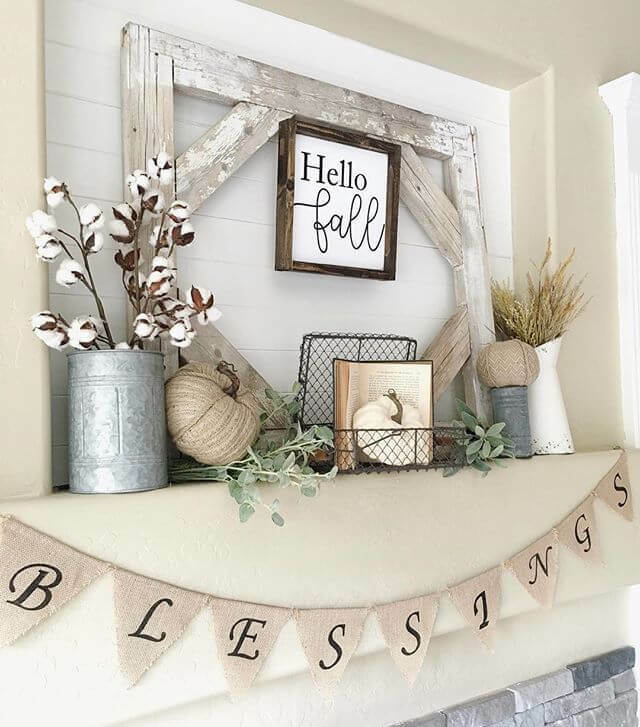 Unique black and white distressed shutters stand at the ends of the mantel. The strong black and white contrast is softened with a pitcher of tan silk blossoms.